Under 3 % of children under the age of eighteen,as a child are ever placed on psychotropic medication(s) and are at severe risk of imminent harm while on these meds as research demonstrate. When a child is placed in state custody/supervision, medication more times than not are administered." WHEN YOU'RE REALIZING what is going on, it is up to you to begin your lawsuit timely against such vile abhorrent caseworker,and take back your right as your family when suing." Deadline do exist everyone." Help form click here,or on any page or on our home/front page to begin." Then call to commence your 1-on-1 POWER session today." Judge: I just visited the child. There is nothing wrong with her and the child is healthy happy and doing so well under our state supervision." The child is doing so well judge, much better than when the child was at home with their parent,grandparent etc. Click when suing pro-se self file per employee who is violating your family rights,parental right,children rights." 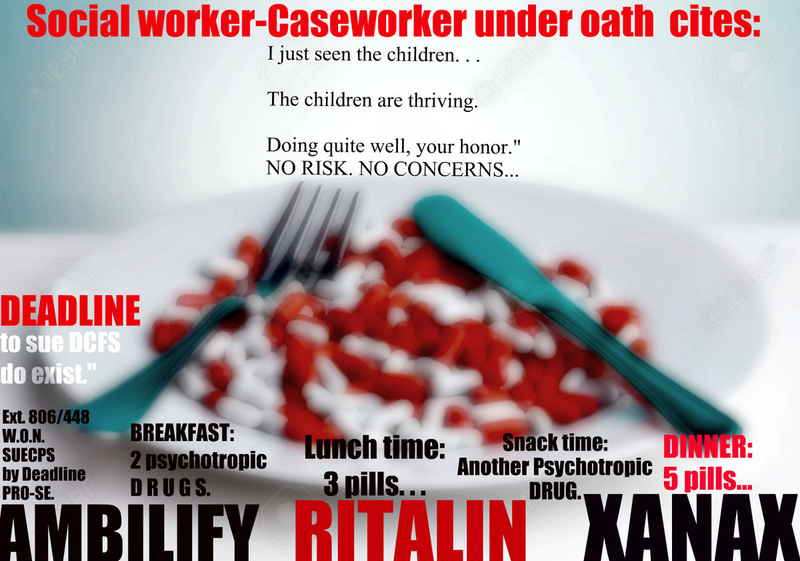 Caseworker swear under oath knowingly that the child under state supervision the children are all thriving and is absolutely at "no risk of harm" while living under state cps supervision however later on as the case move forward in a juvenile dependency/superior family court hearing, the family learn the truth as to the child real "condition." Click when you're gearing up to sue for per violation, harm that has darken your family life,per violation." >Beaten by a staff member in a medical "facility,residential treatment facility." >Force-Fed Medications, a various amount of psycho-tropic medications throughout their entire stay under state supervision and care but yet DFPS,DCPP,DYFS says,"Child is fine." States such as New Jersey, Florida, NY,NC,California, Arizona and a few other states for which experts cite and through research that dangerous psychotroic force-fed meds given to once happy innocent children under the age of eighteen as a child under state "supervision" suffer more times than not, where, the mis-use of drugs given to the child and or the overuse the "overly medicating"of one's child under state care and supervision that higher than 26 to 30 percent of institutionalize children in "state" foster care sytsem are seemingly more times harmed by such and lower risk when the child is able to be at home with the parent,and or temporarily with a blood-kin family member. the children suffer much more with a "stranger" as one expert cites in such article, a foster"parent" and how most times it is the "foster parent"who also want the child on meds, even if the child has ZERO history of it,along with the caseworker who more times than not see "nothing wrong"with placing children remove from their once happy loving home on dangerous meds. wait 15 to 20 minutes after submission to check email inbox.